We all know that our feathery new world friend can emerge from the furnace a touch on the bland side. The old bird’s silver lining is a free rein when it comes to wine pairing. Whites or reds make excellent matches, particularly those that are packed with flavour. Sparkling wine should not be overlooked either, especially those in richer styles. When contemplating this slightly bewildering array of options, it pays to consider what you’re eating alongside the turkey. A rich gravy, a complex stuffing, various porky accoutrements, sweeter root vegetables, cranberries, sprouts (eek!) – they all change the game when it comes to wine pairing. If you enjoy turkey without too many trappings, then the obvious choice is Chardonnay with a bit of oak influence. The buttery flavour and rich texture will elevate the bird to new heights. White Burgundy from the Côte d’Or is the obvious choice. We love the quality and value you can find in Saint Aubin. If you are pushing the boat out (it is Christmas after all) then consider the rich exoticism of Meursault or the steely energy of Puligny. There are lots of great white options beyond Burgundy. Kumeu River in New Zealand is giving the Côte d’Or a real run for its money and, while it’s not Chardonnay, the creamy richness and old vine intensity of the Gran Autòcton is another fantastic alternative. 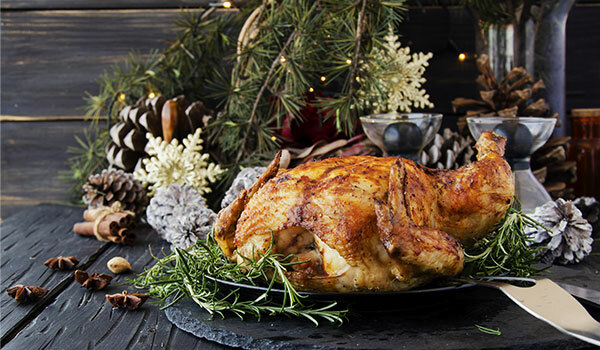 If you resist the temptation to drown the bird in a very rich gravy or lashings of cranberry sauce then it could be time to experiment with a sparkling wine pairings. This is highly fashionable in sommelier circles because of the versatility and textural ebullience of these wines. The all-Pinot Gonet-Médeville Blanc de Noirs would add real sparkle to a Christmas dinner, as would richer blends like those from Egly-Ouriet. If you’re planning on going to town with the trimmings then it may be wiser to stick to red. You’ll want something with bright acidity and plenty of juicy red fruit. Pinot Noir is the obvious choice but it’s not quite that simple. With a rich gravy, you’ll need a younger, fruitier wine with a bit of body. A Volnay would be perfect, or perhaps something fruit-led from Mercurey, Marsannay, or Morey-Saint-Denis. Don’t dismiss new world options either. New Zealand is a rich hunting ground for top quality Pinot in a fruity style. We adore the wines of Rippon and Tongue & Groove. If the stuffing is elaborate and fatty then you’ll want some grippy tannins to balance it out. That might call for a Givry, Pommard, Gevrey-Chambertin or something earthier from Nuits-Saint-Georges. Pinot isn’t the only show in town. Good Beaujolais works superbly with fruitier trimmings. If things are more herby, try the earthy, cherry reds from Etna’s native Nerello Mascalese or brighter styles of Sangiovese. Lightly oaked Rhônes provide a spicier alternative. Bordeaux blends are fine if not too overpowering. Try something like Tassinaia which mixes plummy flesh with lifted strawberry aromatics. Claret with a bit of bottle age is best. Even the blandest bird can be resurrected by a bottle of 1996 Léoville Barton. If you are going for some serious stuffing or a sweeter root vegetable then it’s worth considering the rich, nutty intensity of the Thévenet wines from Domaine de la Bon Gran. Viognier would be a good match for stuffing laced with apricot or apple. Try Les Gendrines from Domaine Pierre Gaillard or some top notch Condrieu. A proper Pinot Gris from Alsace would work too. A couple of things to avoid. Don’t go overboard with the sauces. The Cranberries will ‘linger’ (sorry) unpleasantly alongside most white and sparkling pairings, as will the bread sauce. Brussels sprouts are next to impossible to match so anything you can do to disguise them is probably wise. For a full list of our ‘Best Wines With Turkey’, click the button below. Whatever you chose to drink this Christmas, we hope it brings great joy and we hope it results in a second bottle!